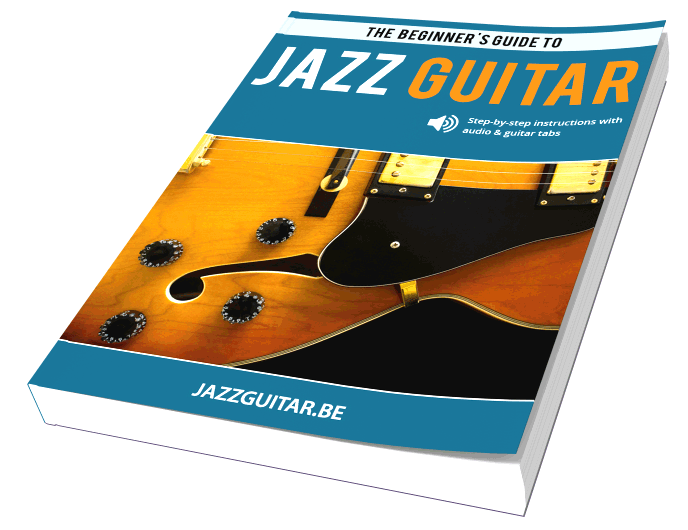 When learning how to play jazz guitar, it is essential to spend time studying, analyzing and learning licks from great players such as Wes Montgomery, Joe Pass and Charlie Christian. While learning classic licks, getting them under your fingers and working them in 12 keys is important, it’s equally important to understand the architecture of each lick so you can incorporate the concepts behind the lick in your own guitar solos. In this section you’ll learn 5 finger-friendly jazz guitar licks in the key of Eb major. By practicing these licks you’ll get 2 important patterns into your fingers: the 1235 pattern and chromatic enclosures. The 1235 pattern is a famous pattern in jazz. John Coltrane used it a lot in his solo on Giant Steps. An enclosure is the technique of approaching a target note (often a chord note) with notes above and below the target note. These approach notes can be diatonic or chromatic (or both). In this lick, you will hear an F triad at the start and end of the line. Though it’s a simple technique, applying triads to your soloing ideas, sometimes it is the simplest concepts that produce the coolest results. This maj7 lick uses the bluesy b3 as well as the bluesy b5 note to build a classic sounding phrase over Fmaj7. This line has been used by countless jazz musicians over the years and is a phrase that is worth working in 12 keys. Here is a short Dmaj7 lick in the style of Larry Carlton featuring both a pull-off and slide. Larry is a big fan of adding a legato sound to his playing with slurs, and so working these techniques out can help you bring a Carlton vibe to your lines. This major scale lick works over an F pedal bass note and is basically a simple 6th interval pattern transposed down the scale, a typical Jim Hall technique that also inspired Pat Metheny, who uses similar kind of ideas. 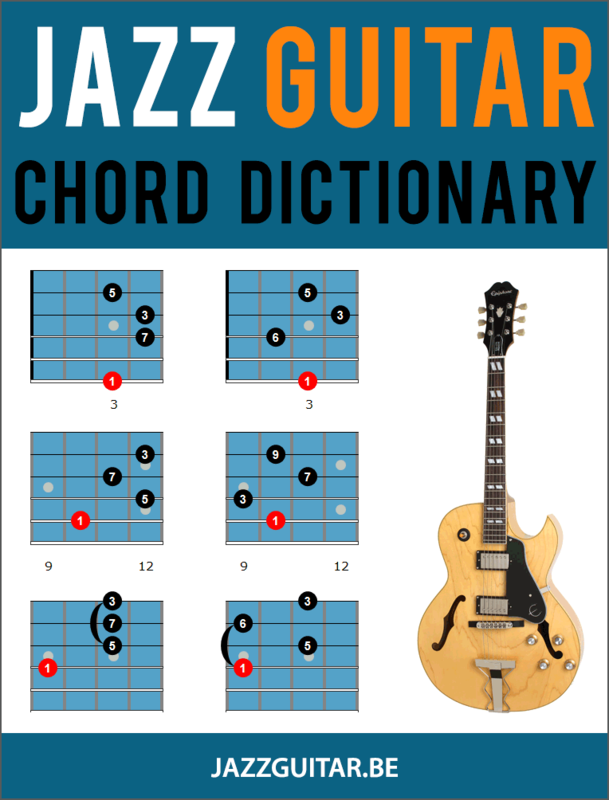 In this section you’ll learn 5 jazz guitar licks that work well over dominant chords. Learn them in different keys and positions on the fretboard. This first Dominant Lick blends the Mixolydian mode along with a blues note (the b3), used to bring a bluesy vibe to any 7th chord soloing phrase. If the Mixolydian scale is new to you, check out this lesson on guitar modes. Notice the placement of the b3 (written as A# in this example, between the notes A and B). It acts as a passing note and blue note at the same time. Here is a repetitive pattern that highlights the interval of a 6th between the 3rd and root of the G7 chord in the underlying progression. Repeating a phrase in this fashion allows you to play the lick twice, once on the & of 1 and again on the & of 4, preventing the lick from sounding monotonous in your phrase. Also, notice how one note is different in the second repetition of the lick, which also helps to prevent a sense of monotony in the line. We’ll now move on to one of the most common 7th chord devices in jazz, the dominant bebop scale, which is a Mixolydian scale plus an added major 7th interval. Notice that there is also an Am triad near the end of the first bar that helps to reset the lick back to the D that was played right before the triad. Triads are a helpful way of running up a chord line to avoid sounding too scalular in your playing. Moving on to an altered lick, this phrase uses the G altered scale to bring a sense of tension to this line, before resolving this tension to the tonic at the start of the second bar. When applying the altered scale to dominant chords, you will need to take care that you resolve those altered notes so that you don’t leave any tension hanging in your line. Here is a classic 7alt line in the style of Pat Martino. Again, notice that the tension notes are resolved and not left hanging over the underlying chord change. Here is a minor blues scale lick that is applied to an A7 chord. Using the minor blues scale over a 7th chord is a great way to bring a blues sound to your jazz lines. While this approach works well for bringing a bluesy sound to your jazz lines, you will want to be aware of how often you use the minor blues scale over a 7th chord in any given solo, as if you overdo it, you might end up leaning towards a rock/blues feel a bit too often. 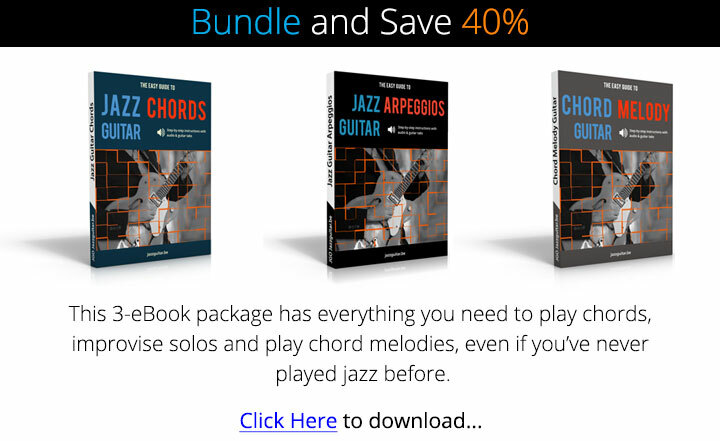 Check out the guitar solos of Kenny Burrel, Wes Montgomery, and George Benson for classic examples of how these legendary players use the minor blues scale to create a bluesy vibe in their 7th-chord soloing ideas, without overdoing it at the same time. Another great way to bring a bluesy vibe to your 7th chord lines is to use double-stops in your improvisation. Here is an example that uses double-stops taken from the Mixolydian mode which brings to mind the lines of jazz organists such as Jack McDuff and Lonnie Smith. Though there are no blue notes in this line, the use of double-stops against the tonic pedal note (A) creates a blues vibe. This dominant phrase in the style of sax legend Charlie Parker, can also be found in the solos of Joe Pass and Pat Martino. Built by combining the 1235 pattern with the b3, 4 and #4 intervals from the minor blues scale, this line mixes major and minor tonalities to create a classic jazz blues line in the style of the great players mentioned above. Here is a dominant lick on E7b9 that resolves to Am7. Over the E7, an Fdim7 arpeggio is played, creating the 7b9 sound. This last dominant lick uses chromatic approach notes and enclosures. This dominant lick in the style of Bireli Lagrene features large interval skips, slides between notes, and chromatic notes over the underlying G7 chord. In this lick in the style of Herb Ellis, you’ll find the #4 used over C7 (F#) to create a turning and twisting type sound to the start of this line. From there, the lick runs typically Herb Ellis scale patterns until it finishes with a 2-note chord (the 3rd and 7th of the underlying C7 chord). Though not incredibly fancy, it’s a great-sounding line that you can bring to your dominant 7th jazz guitar vocabulary. Here, you will find a characteristic Herb Ellis lick where you are applying the Lydian dominant sound to a C7 chord. The Lydian dominant scale (the 4th mode of melodic minor scale) brings a 7#11 color to the underlying harmony, and here is a great example of how to address that #11 tension in a musical and proper fashion. The lick uses a lot of different alterations, including #4, #5 and b9 intervals, as this line snakes its way up the fretboard over a D7 chord. Kurt Rosenwinkel is a master of long, snake-like lines that cover a lot of real estate on the fretboard, and this lick is an example of that side of Kurt’s improvisational style. 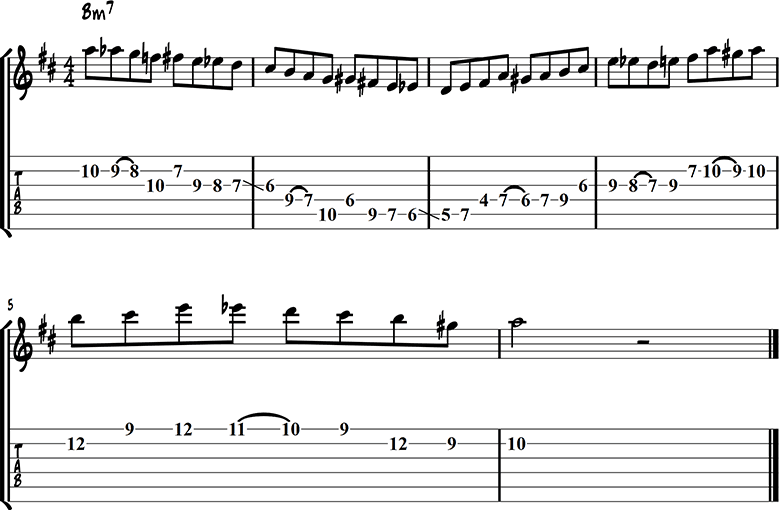 In this Lee Ritenour lick you will play 3-notes per string, syncopated rhythms in bar 2, and a blue note (b3) in the final measure of this G7 line. This Bill Frisell lick uses a b9 interval over the V7 chord (G7), before resolving this chord to the Imaj7 chord (Cmaj7) at the end of this phrase. Mixing both the natural 9 (A) and the b9 (Ab) into one bar over a V7 chord is something that Bill often brings to his lines. The first half of bar 1 features a string-skipping phrase, that starts on the 7th and the uses the 9th and a lower-neighbor tone to complete that idea. There is a descending 3rd line that finishes the lick, moving chromatically down the neck from the 6th to the 5th of C7, with 3rd intervals below each descending chromatic note. Here is a short A7 lick that features the major blues scale, which is a major pentatonic scale with an added b3 interval. Using the major blues scale over 7th chords is not only a characteristic of Larry’s soloing lines but of the fusion genre as a whole. This is a melodic lick in the style of John Scofield over a V going to I minor and uses the C minor harmonic scale. John Scofield uses a technique called double stops here. A double stop is when you play 2 notes at the same time and can be used to outline the harmony in your solos. Here is a slippery little G7#11 lick that uses the Lydian dominant scale, as well as a number of hammer-ons and pull-offs. A lot of Scofield’s lines are full of slides and other slurs, especially from a weak beat to a strong beat. Having a strong control of these concepts will go a long way into bringing a Scofield sound into your solos. In this section, you will find guitar licks in the minor key. Try the licks in different keys and fretboard positions. To begin, here is a minor ii V I lick in Am that uses the A natural minor scale to outline all three chords in the progression. When soloing in this fashion, you don’t get the Major 3rd of the V7 chord, but you do get three alterations needed for that chord (b9, #9 and b13). Here, you will use the A harmonic minor scale to solo over the E7 chord (V7), in this minor ii V I progression. This is a common scale choice over the V7 chord in a minor key, as it gives you the major 3rd interval, but also the b9 and b13 of that chord. Here is a common variation of the previous lick, which again uses the harmonic minor scale to solo over the V7 chord in the progression. Learning a few variations to common licks is a good way to expand your soloing vocabulary without starting from scratch. as well as between the root and 9th of the chord. By adding chromatic notes into your lines, you can create a sense of tension and release over minor 7 chords, which is an important ingredient when learning how to bring a jazz sound to your improvised solos. Another fun way to outline m7 chords is to play the major pentatonic scale from the 3rd of that chord, such as the C major pentatonic scale used over the Am7 chord in this example. Though the C major pentatonic and A minor pentatonic scale contain the same notes, by starting on the note C and thinking of the scale from that root, you will focus on non-root notes for the underlying chord. This is a great way to use pentatonic scales in your solos without always starting and stopping on the root of the chord. One of the most commonly used ways to outline a m7 chord in jazz context is to play the 3 to 9 arpeggio (the notes 3-5-7-9 of the underlying chord). By doing so, you are outlining the given m7 chord, but are replacing the more plain-sounding root with the more colorful 9th. A 3 to 9 arpeggio is when you play a maj7 arpeggio from the 3rd note of the m7 chord you are on, as you can see in this example where a Cmaj7 arpeggio is played over an Am7 chord. This guitar lick in the style of Pat Martino is a good exercise to get some common chromatic patterns into your fingers. The end note of the lick is the same as the begin note, so you can play it in a loop, as I do in the slow version below. Known for his “minor conversion” approach to soloing, where he sees every chord he plays as some sort of minor shape on the guitar. Pat Martino loves to start lines from the 2nd of any m7 chord and run up the 3 to 9 and 1 to 7 arpeggios from there. Here is an example of that approach over an Am7 chord, where he starts on the 9 (B) and continues with a Cmaj7 arpeggio, creating a 3 to 9 arpeggio. Try it out and see if you can bring a bit of a Martino vibe to your next jazz guitar solo. With this lick (which has a very modern sound to it), you will be switching between the A minor pentatonic scale and the Bb minor pentatonic scale, a technique called side-stepping. Side-stepping is when you are using a pentatonic scale a half step away from the root of the chord you are on. It can sound very cool when you get this approach down but may sound a bit “weird” at first. Take your time, work with a backing track when using this technique to hear it in context, and have fun exploring it in your lines and phrases. In this lesson, featuring videos from Chris Standring (author of the successful guitar course Play What You Hear), you will learn how to take small, manageable licks and connect them in a musical way to build longer lines in your jazz guitar solos. By breaking down long lines into short, easy to play licks, you will not only add some great sounding Bebop lines to your vocabulary, but you will give yourself the building blocks needed to create hip-sounding lines on your own. To begin, here is a “master list” of all of the mini-licks used in the longer lines below. It would be good to start this lesson by playing through each of these smaller ideas, learning how they sit on the fingerboard and how they sound as individual ideas. This will help you learn to recognize these small yet important licks later on when you begin to explore the longer bebop lines below. Feel free to refer back to this master list as you work through the longer Bebop lines in order to refresh your memory with these short licks, as well as use these short ideas to create your own bebop lines later on in the practice room. In this first example, which is played at both slow and fast speeds in the video, you can see how Chris takes 5 short licks and connects them to form a longer, three-bar bebop line over an Em7 chord. Work this line slowly at first, paying attention to the lick as a whole, but also the short licks that are connected in order to build the longer phrase. It’s just as important to see the small licks as they come together as it is to get the longer line under your fingers. This second example, which you can see at both slow and fast tempos in the video below, uses some of the same licks as the previous line, but now adds some new ideas to the mix over the course of these 3 bars. If you can get the long line under your fingers, as well as understand and hear how it was built by connecting the smaller ideas, then you not only get a cool sounding lick to use in your solos, but you are well on your way to building lines such as this on your own. In this third and final example, you can see how four licks from the first and second lick are connected in new ways to derive a unique sounding phrase. Check out the video for a demonstration of this lick in both slow and fast speeds, then take this lick to different keys and tempos around the neck. This minor lick in the style of Larry Coryell uses the #7 interval from the D melodic minor scale to solo over a Dm7 chord. Using melodic minor over m7 chords is not only something Coryell uses in his improvisations, but it is characteristic of many legendary players. This minor modal lick showcases Larry Coryell’s love of slurs, as well as his ability to move down the neck in a horizontal fashion. In this minor chord lick in the style of John Abercrombie, you will use a 3 to 9 arpeggio over Gm7, in this case starting on the 9th and moving up the arpeggio from there. As well, there is a #7 from the melodic minor scale used later in the phrase, which adds a bit of tension to the line that you later resolve before ending the lick. The next lick features a Bbmaj7#5 over a Gm7 chord, which highlights the 3 to 9 arpeggio that you saw in the previous lick. If you want to outline a melodic minor sound over a minor 7 chord, playing a maj7#5 arpeggio from the b3 of that chord is a great way to bring this sound into your lines. This minor ii V I lick in the style of Jimmy Raney uses both a passing tone (P.T.) and a b9 over the V7b9 chord. This short minor ii V I lick features a blue note (B.N.) which is the b3 interval played over the A7b9 chord. This John McLaughlin lick uses the D harmonic minor scale over a minor ii V I progression. 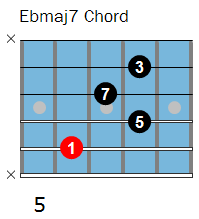 In the second bar, John McLaughlin applies a sweep picking technique before resolving down to the 9th (E). This McLaughlin inspired minor ii V I lick is built off of the harmonic minor scale from the tonic key of A minor. Though not every note of this scale will fit over each chord individually, when navigated in the right way, you can and hear how this scale can produce just the right sounds needed for each chord in the progression. The last minor ii V I McLaughlin lick again uses the A harmonic minor scale to outline the changes in this chord progression. The G# in bar two helps bring out the sound of the underlying E7alt chord. The G# in bar 3 brings out the raised 7th sound (mMaj7) over the underlying Am7 chord. Here we have a chord lick in the style of Jim Hall, featuring characteristic voicings and a chord sub that Jim loves to use over minor ii-V-I progressions. In the first bar, Jim often uses an A7alt chord instead of Am7b5, creating a V/V to V to Im7 progression in place of the normal ii-V-I chords you are used to seeing. This is a fun and relatively easy way to spice up any minor ii V I phrase that you are playing, using chord and/or single-notes to outline that sub. This is exactly the kind of lesson I find the most useful. It’s focused around a tonal center (Ebmaj7) and specific ideas (Coltrane patterns & enclosures). You present enough examples to give plenty of ideas for variations within the same theme. Good lesson and big help by new method wz kind video instruction. Thank you! 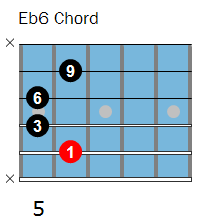 For fun, I added a note to your Eb6 chord: fret 6 of the thin E string – and the new chord so created sounds nice when played at the end of your Eb6 licks. What chord is it? I mean is that an Eb6/7 ?? Or something? Anyway, your lessons are so well thought-out that I can only recommend them to any guitarists. Thanks so much again for sharing your deep knowledge of Jazz. Thanks. That’s the same chord, you just added the note Bb, the 5th into it. Matt Nice licks. You should do one on All Blues. The options for the D7#9 and the Eflat7#9 chords. Thanks, Matt… I’m just fallin’ in love with ma guitar, again! Very nice! thank you, and I concur with James (Indiana)!!! Verry cool Matt!! I ry is licks also. Thank you Matt for this superb lesson. I also agree w/ Sal about doing a similar lesson w/ “All Blues”. Hi, nice licks, just curious if there is a reason you don’t or couldn’t show the finger numbers to use? I know that I can watch most of the video’s and figure..cheers and thanks much! Matt, you should “charge” for these lessons. That will make them more credible. Right now it just “looks” like you are ripping off other players’ licks. Just put up examples of your original time-tested licks, and charge a nominal fee. Most folks are really skeptical about “free” stuff. Especially in this day and age. Scusami ma leggo appena l’inglese figurati a scriverlo ! Absolutely brilliant. I have numbers 1 and 5 down. Now 3 more to go. Thank you for these treats. I love them. BRILLIANT – enjoyed them all. Trying to exercise in order to insert them in my vocabulary. Regards from Campinas, SP, Brazil. Why is the C note in your Eb6 chord diagram called 13 instead of 6? Hi Bob, forgot to cbange that in the software, fixed it. Cheers! When you move 1235 to the 5th degree, you happen to have chosen the only scale degree that preserves the intervallic shape without using accidentals: what if you moved to say the 2 or 6? Would the 3 be flatted?